Ernest Hemingway and his wife Mary left their home in Cuba in July of 1960 as he battled both illness and deep depression. They settled into their property in Ketchum, Idaho, near Sun Valley, where Ernest began treatment for his ills. But, the depression worsened and in July of 1961 he, like his father before him, killed himself. Following Hemingway’s death, his wife Mary contacted the Cuban government regarding their home and was informed that the government had taken possession, as they had already done with billions of dollars of US assets. She was able to negotiate a return to pick up a few paintings, books and Hemingway’s manuscripts. Everything else was left behind. The Hemingway property, like many other properties in Cuba suffered from years of neglect. But in 2007 they turned it into a museum and have kept it up ever since. This was the last tour of our trip. Our guide, Pedro again, has had first hand knowledge of property rights in Cuba. As he tells the story, he once had a beautiful home by the sea. But, during the Cuban Missile Crisis, which came in 1962, the government trumped up fear that Cuba itself would be invaded again. To provide security, the military took possession of homes strategically located, and his was one of them, he said, even then everybody knew there would not be an invasion. Somebody in the military wanted his home and they took it. Now, we would have loved to hear more and to explore the feelings of the people regarding their government. But, this is the kind of conversation we were specifically advised to avoid. So, I said, tell us about Hemingway! It was Martha Gellhorn, Hemingway’s third wife, who first found the property and persuaded him to rent it so she wouldn’t have to stay cooped up in the Havana hotel where he was writing For Whom the Bell Tolls. He finished most of that book in his new home and used part of the proceeds from the royalties to buy it. He named the home Finca Vigia, or “Lookout Farm” It is located in the little village of San Francisco de Paula, about 15 miles east of Havana. When you first arrive there, you find an admission gate and then a short drive takes you to the tourist center, with two souvenir shops and a small bar. This gentleman is crushing sugar cane for their rum drinks, which I found necessary to sample. Then they have a nice shaded area to enjoy said rum drink, in which, believe me, they do not hold back on the rum. From here we began the walking tour. The first buildings are these, which, at one time, were guest quarters for the less valued visitors. They are now offices for the property managers. Visitors are not allowed to enter Hemingway’s home, but so much is visible from the outside, this is not really a problem except on a rainy day. The living room. For the day, this was a very open floor plan with lots of opportunities for breezes to move through the place. This is the patio to the left of the entrance. When you round the side of the house, there is a walkway that takes you to the pool. Between the pool, and what used to be a tennis court are the graves of Hemingway’s favorite dogs. 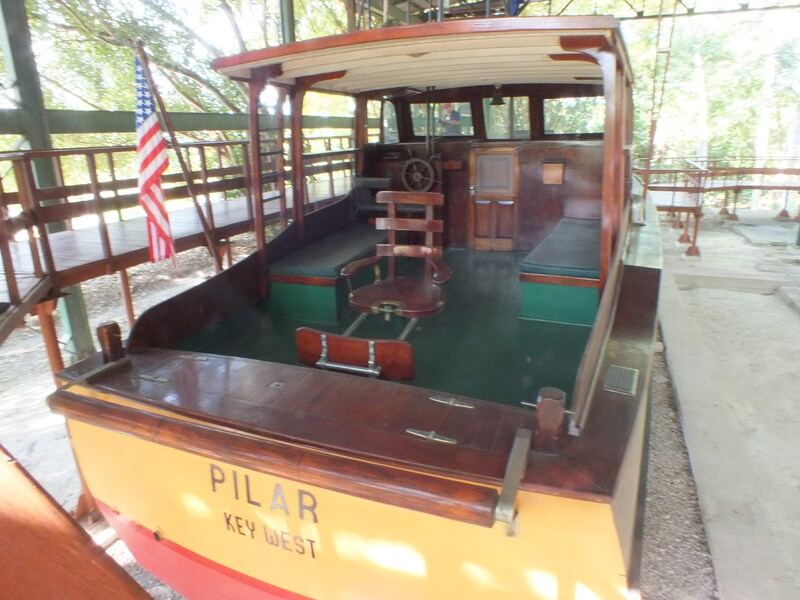 Now, I have to tell you, people, I have been a Hemingway fan since my college days and, also being somewhat of a seafarer, I have long been fascinated by his adventures on his boat, the Pilar. I had once read an article that described this beautiful boat as rotting at its moorings due to neglect and so, had assumed it had long ago gone the way of hundreds of thousands of wooden boats and simply wasted away. Imagine my surprise, when I look up and there, where the tennis court had been, was the Pilar, meticulously restored to its former glory! As you can see, it still has Papa’s fishing chair and everything just as it was. 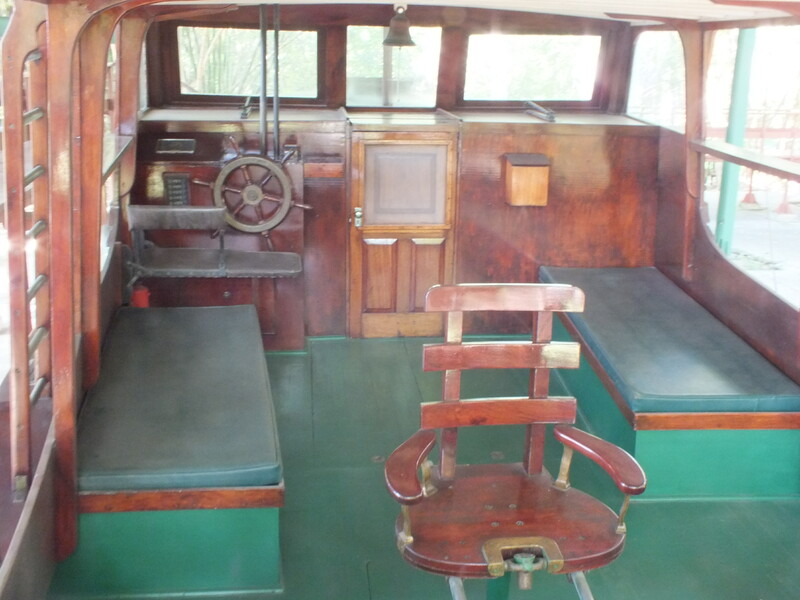 Imagine Hemingway sitting right there, hauling in a big one! She was equipped with downriggers on the side. This is what she looked like under power. EH6956P Ernest Hemingway aboard the Pilar. Photographer unknown in the John F. Kennedy Presidential Library and Museum, Boston. After returning from the pool area, more of the house was open. This is the same living room from the opposite end. You will note a large collection of bottles of booze next to the chair. Hemingway was an alcoholic’s alcoholic, rarely drawing a sober breath, even while working. This was the Hemingway’s main bedroom, not nearly as grand as in his home in Key West. Barely visible in the background is Hemingway’s typewriter. Having survived two plane crashes, shrapnel from the war, and numerous other serious injuries over his life, he found it difficult to remain seated for any length of time. Often he would write standing up. In this home he would not only finish For Whom the Bell Tolls, but also The Old Man and the Sea.Hemingway typed with just his index fingers. Shooting supplies on the desk. This was a storage room off the kitchen. Apparently, notebooks were in short supply. He recorded his daily weight on the wall. Martha and Ernest formally purchased the property in 1940. In 1945 they divorced. Ernest kept the place and Mary, his fourth and final wife eventually moved in after divorcing her husband back in the States. In time, she hit upon the idea that Ernest needed a separate work room with a view of Havana. He must have agreed in principle since she could hardly keep it a secret. However, he rarely used it, instead turning it over to their large family of cats. Today, if you choose to climb it, his office has been restored. And, the view of Havana is spectacular! There is also a lady up there who will take your picture. A small tip is appreciated. In the doorway is the loser of the Hemingway look-alike contest, prepared to write his memoirs. Typically, most tours would have ended here. But, Pedro had a special surprise in store! A trip to Cojimar. In Hemingway’s day, Cojimar was a small fishing village, about a 15 minute drive from Finca Vigia. In fiction, it is the village in The Old Man and the Sea where Santiago lives. In real life, it is where the Pilar was moored. At the heart of Cojimar is, as you might imagine, is a bar called La Terazza de Cohimar, Hemingway’s favorite when he was in town. To walk into La Terazza is to walk into the ’50’s. It is spotlessly clean with wood paneling and gorgeous views out all the windows. A lot of Hemingway-related art is displayed including this picture of the Pilar moored next to the Cojimar Tower. Here is the tower as it is today. Built in 1646, it was designed to keep invaders from going up the Almendares River into Havana. Here are some other Hemingway pictures on display. At one point, Hemingway sponsored a fishing tournament. Fidel won the tournament, although our guide maintained that Hemingway actually caught the fish and gave it to Fidel to claim the prize. i find no other record supporting that view. I later found a picture of Fidel and Che Guevarra fishing in the tournament. A little different look from the typical revolutionary pose. . This is the view outside of La Terazza, where boats would have been moored. Near the Tower is a statue of Hemingway, so Pedro took us down there. This young man started working John for a few pesos shortly after we got out of the car. Cohimar is in a beautiful setting, but is in no better state of repair than any other part of Havana. There are winners. There are losers. The story of Cuba in a nutshell. Mike, this was very interesting article. Hemingway was a very interesting individual. Am so glad that you wrote this article, cause it gives me even more perspective on this famous man. Thanks again. Love your stories. Thanks for taking us on another adventure.